UK: British doctors said Wednesday they will insert a titanium plate in the skull of Pakistani schoolgirl Malala Yousafzai to repair a hole left when the Taliban shot her for campaigning for girls education. Surgeons at Queen Elizabeth Hospital in the central English city of Birmingham plan to carry out the operation to protect the 15-year-old’s brain within the next 10 days. “This is, very simply speaking, putting a custom-made titanium plate over the deficit in her skull, primarily to offer physical protection to her brain in the same way as a normal skull would,” the hospital’s medical director Dave Rosser said. Malala, who was attacked in Pakistan’s Swat Valley last October as she travelled on a bus to school, has become an internationally recognized symbol of opposition to the Taliban’s drive to deny women education. Doctors say the bullet fired at point blank range by a Taliban gunman grazed her brain and travelled through her head and neck before lodging in her left shoulder. The attack caused her to be completely deaf in her left ear, so surgeons will also insert an electronic device into the ear that should help her hearing return to near-normal levels within 18 months. Surgeons in Pakistan who were the first to treat the teenager before she was brought to Britain inserted the missing section of her skull into her abdomen, but it had eventually been decided not to use the bone. “The safest way to store that bone, to keep it sterile and healthy, is in the patient’s body, so they will make an incision in the skin and tuck it into the abdomen,” Rosser said at a press conference, explaining the procedure. “Surgeons in consultation with Malala have decided that fitting this titanium plate is a better long-term procedure than trying to re-implant the bone after such a long period of time.” The piece of skull will be removed, sterilised and -- if she wants it -- given to Malala as a “souvenir”, Rosser added. 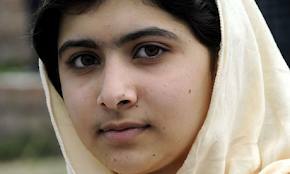 Malala was temporarily discharged by the hospital on January 4 and is currently staying in Birmingham with her parents and siblings, who have joined her in England. Her father has been given a job as education attache at Pakistan’s consulate in Birmingham, a city with a large Pakistani community. Rosser said Malala was a “remarkable young lady” and despite her ordeal she was determined to continue speaking out for girls’ right to education. “She is very lively, she has a great sense of humour,” he said. “She is not naive at all about what happened to her and the situation she is looking forward to in terms of being a high-profile person, and potentially a high-profile target. The hospital in Birmingham was chosen for Malala’s treatment because it has vast experience of treating gunshot injuries sustained by British soldiers in Afghanistan. Rosser said although specialists in Britain had more experience of reconstructive surgery than their Pakistani counterparts, Malala owed her life to the surgeons in Pakistan. “There is no doubt that the surgery performed in Pakistan was life-saving,” he said.